I've seen Vincent get a lot of flack from some people over the years, but as far as I'm concerned he's one of the coolest robots in all of cinema. Program Slave to his shadow and literal love machine. 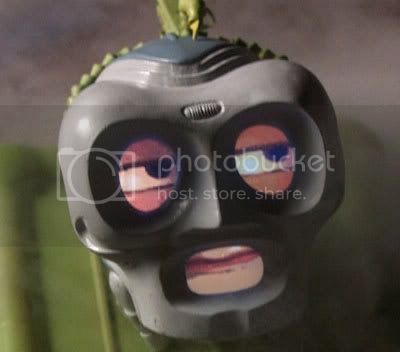 790 is a robot head who appears in the TV series "Lexx" as one of the main characters. 790 was a robot who worked machines that turned humans into love slaves by messing with their DNA. Due to an accident involving alien monsters called Cluster Lizards, the would be love slave Zev was transformed into a highly libidinous and aggressive half-human/half-lizard. 790's head was thrust into the machine in time for the love part of the love slave and became hopelessly in love with Zev. 790 joined Zev aboard the Lexx and the two had many adventures together. 790 was later rebooted and fell in love instead with the undead assassin Kai. 790 is incredibly rude and cares for no other people except for Zev. His lack of concern for others proves to be frustrating and 790 proves to be even more sinister after falling in love with Kai, constantly manipulating the situation so that the other people in Kai's unlife are gone. Trivia It was revealed on the Season 2 DVD that 790's fragment of human brain came from a woman. Ahh, I forgot 790, that dirty old bot head. Glad to see he...er she, made it. Lexx? I loved the movies (season 1) and season 2. But it lost steam (for me) after that. I got so sick of the Prince -- man they milked that plot-line/character to death. I got so sick of the Prince -- man they milked that plot-line/character to death. Have to agree with that, I was sick of that character after a few episodes. The Iron Giant is a giant alien robot that appears in the movie "The Iron Giant", based on the book "The Iron Man" by Ted Hughes. The Giant is an alien robot that crashed on Earth in the 1950's. The crash did damage to his head, causing him to lose some of his faculties. He is found by the child Hogarth Hughes and befriends him. Soon, the Giant is being hunted by a government agent, forcing Hogarth to hide him with a beatnik, who also befriends the Giant. The Giant is incredibly tall but has a gentle heart. It also has the mind of a child, slowly learning English and the way of human life. It also has difficulty with learning how to properly behaving, sometimes making hiding him difficult. He eventually decides to become a pacifist and wants to be thought of like Superman. Later, it is revealed that the Giant may have been sent to Earth for sinister (or at least agressive) purposes. In the original novel, he also fights a Space-Bat-Angel-Dragon and the fact that never appears in the movie is a tragedy. SEQUEL PLEASE! 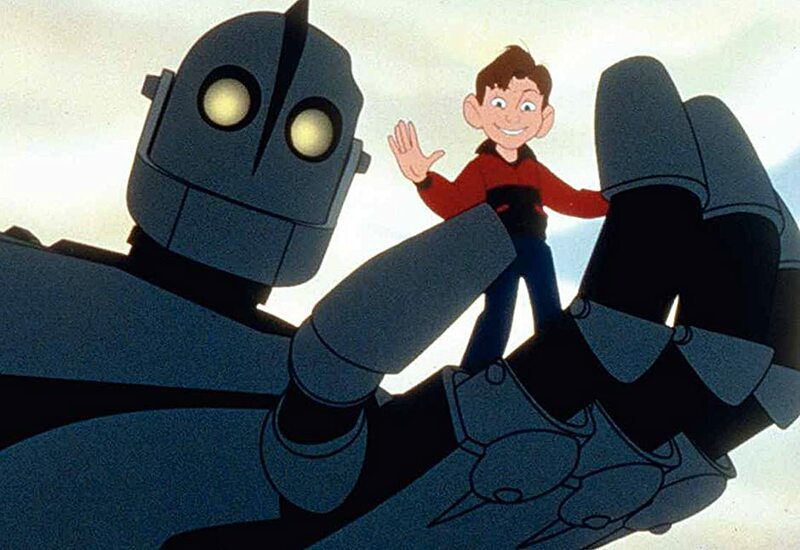 Trivia Peter Cullen, Sean Connery, Frank Welker, and James Earl Jones were considered to voice the role of the Iron Giant, but it went to Vin Diesel instead. Program Servant. To the max. "Possession? Oh no one “owns” the '80s robot. He’s independent, has his own agent and publicist and everything. From what I understand, he’s reading scripts and looking for his next project, which I suspect will be a remake of a sci-fi hit from the '80s." The '80s Robot is modeled after multiple actual robot toys that were created in the 80's, including Omnibot 2000 and R.O.B. the Nintendo robot. The '80s Robot constantly uses expressions and slang popular in the '80s and is shown serving popular '80s beverages like Tab and New Coke. The Robot is also capable of surfing the internet, but must do so using a very loud modem. Trivia In the screen credits and other press material, the character is listed as "80's Robot," incorrectly marking the decade as a possessive rather than an abbreviated adjective. I dig that movie, and the next one (Most Wanted) too. Most of the Muppet movies. That guy should hang out with the Rocky 4 robot. OMG... I just had a horrifying thought... what if ROTOR ends up being on the list, or worse... number 1? The T-1000 is a liquid metal robot that appears in the movie Terminator 2: Judgment Day. Following the failed attempt to murder Sarah Connor before she can give birth to the leader of a rebellion, Skynet, an evil computer, sends another killer robot back in time: the T-1000. The T-1000's mission is to hunt a young boy who is destined to fight and win against Skynet, John Connor. Soon he finds himself opposed by a T-800, reprogrammed to save John, and must kill Sarah, John and the T-800. The T-1000 is unique in that it is a robot that can turn into liquid. To this end, it is capable of changing shape into people and inanimate objects, can turn it's limbs into bladed weapons and is invulnerable to most forms of damage. Though a powerful physical threat, the T-1000 often relies on trickery in order to draw out it's targets. It tends to use a police officer disguise in order to gain people's trust and get information more readily. Trivia Robert Patrick mimicked the head movements of the American bald eagle for his role as T-1000. T1000 is great! He is way past cool, as Sonic the Hedgehog said in the 90s. I even enjoyed Patrick's performance in Double Dragon, so you know I love T1000. On ROTOR, I actually got that VHS for 50 cents and had fun watching that kooky movie with my friends, before even seeing it with a riff! So that movie is watchable in my book, and quite frankly is a masterwork. Calculon is a robot who appears in the TV series Futurama. Calculon was once a mere car manufacturing robot in the 20th century until he was hit by a werecar. Which is exactly what it sounds like. The robot lived for many years, taking on many identities, including David Duchovny, before becoming Calculon in the 30th Century. He is a b-level actor who appears in the popular soap opera All My Circuits. Calculon is a real ham who is convinced he has far more acting talent than he actually possesses. He later went onto star in an All My Circuits film and the disastrous misfire The Magnificent 3, wherein he plays the president's son, who is also the vice president. Calculon later found himself upstaged by Langdon Cobb, a brilliant actor who was also a cosmic being that absorbed attention. In order to defeat him in an acting competition, Calculon performed the death scene in Romeo and Juliet and poisoned himself for authenticity. It was easily Calculon's greatest work as an actor. He did not win the competition. Later, Calculon was ressurected and returned to being a TV actor. Trivia He owned an enormous yacht named "Calculon's Talent" in the pool of which he sails a large yacht named "Calculon's Pride". I just returned to playing Final Fantasy 11 after about 6 months. They're giving 2 free weeks to returning players. Since I've been gone, they introduced a line of quests that lets you get Omega Weapon as a mount. So you can ride around on the back of a big robot.